I'm a 21 year old university student in Halifax. 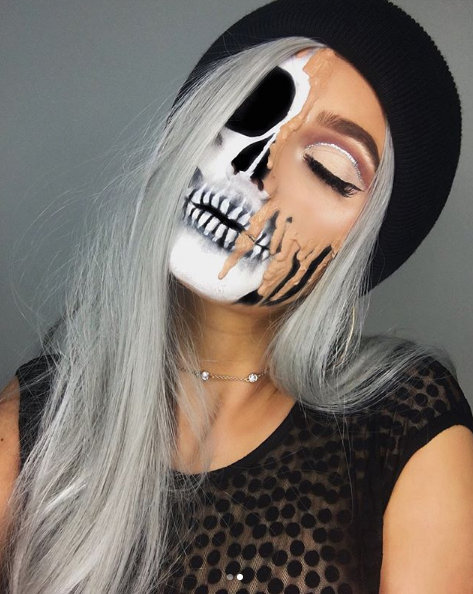 I have a very strong passion for Halloween and makeup especially halloween makeup. 2. How did you get into makeup artistry? I wasn't into makeup until the end of highschool, I only wore mascara to my prom! I became obsessed with beauty gurus and the youtube community which got me started into makeup. 3. Do you think it is something you will pursue professionally? I would love to do makeup artistry as a job, schooling for it is expensive so it may not be awhile before I become a "professional artist". I get a lot of inspo from other beauty instagram pages and youtubers. I am always looking at makeup tutorials and what makeup trends are circling instagram. 5. Do you have any favourite you tubers/ bloggers? I have lots, watching people in the beauty community is what I do everyday. If i had to pick a few of my favourites they'd be Jefree Star, Tati, Shani, and Michael Finch. 6. If you had to give girls wanting to pursue makeup artistry a piece of advice, what would it be? If it's your passion go for it! Practice makes perfect and theres no "wrong" way to do makeup. My dream place to go is Santorini, Greece! Favourite brands at the moment are Nora Swimwear of course; Brandy Melville and American Apparel. 9. Where is your favourite hangout spot in Halifax? My favourite spot is Crystal Crescent Beach in Sambro. It's the prettiest place at sunset. Loved incorporating the swimwear into my halloween makeup looks, I also like to pair the tops with shorts and style them as crop-tops.